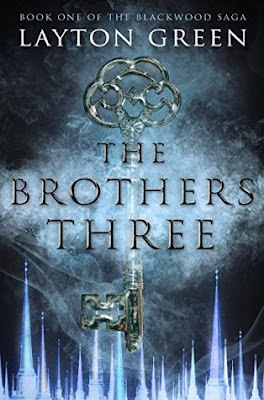 I have been a fan of Layton Green for since I read The Egyptian so when he contacted me about reviewing his newest book, The Brothers Three I wanted to say yes. But The Brothers Three is described as a blend of urban and epic fantasy, neither of which are high on my favorite genres list. My love of Green's writing style led me to say yes and I'm glad I did. Fantasy novels that I have enjoyed usually have one or more characters that are new to the fantasy universe of the story, like with Harry Potter discovering the wizarding world of Hogwarts. In The Brothers Three, we have not one but four characters who are thrown into an alternate universe where wizards rule the world. But this is no Hogwarts. The Blackwood brothers were left basically as orphans when their father died on an archeological dig and their mother had a mental breakdown. The oldest brother Val raised his two younger brothers while putting himself through college and law school. Now he is a high-powered attorney in New York. Val is all no-nonsense, a literal, black & white thinker. While he no longer lives in New Orleans he still sees himself as the family caretaker and will do anything for his brothers. Youngest brother Will is a construction worker by day and a sword welding actor by night. He is a fantasy geek that seeks his adventure in game boards and books because of his debilitating panic attacks. The alternate universe they find themselves in is like he stepped into the pages of one of his novels. His knowledge of fantasy mythos helps the brothers navigate the new world. Middle brother Caleb has a laissez-faire mentality to life. He bartends because it supports his any goes type of lifestyle. There's food, there's drink, there are girls so why not live life even if he could die at any time while in this alternate place. But is there more to Caleb than perhaps even he knows? Then there is ex-military, police officer Lance who gets accidentally taken along in the adventure. He's the warrior the in the group and faces every challenge head on, ready or not. Each character comes to the alternative reality with their own perspective and I think a reader can find their own reaction in one of them. This provides for better buy-in to the story which is so important in a tale that requires the reader to suspend belief pretty rapidly. The Brothers Three is a great fantasy novel with plenty of deadly adventure. There are winks to Dungeons & Dragons and Harry Potter (possibly others that I didn't catch due to my lack of fantasy knowledge). I had to wonder though if these "winks" were tributes to inspirations or just easy ways out. I love Green's writing and his ability to sweep me completely into a story. Yet, with The Brothers Three, I felt his writing wasn't up to his normal standard. I still felt completely consumed with this story, stay up late into the night to read "just one more chapter". However, there were times that I felt pulled out of it by certain elements that usually came with a thought of "really you went there", like when they had to play wizard chess, or "gee that was convenient" when we were told something worked in this universe just because it needed to happen that way. Even though I don't feel that The Brothers Three is Green's strongest novel, he did create an accessible fantasy adventure with great characters that fantasy geeks will love. I know I'm anxious for the next book in the series so I can find out what happens next (yes, there is a bit of a cliffhanger).